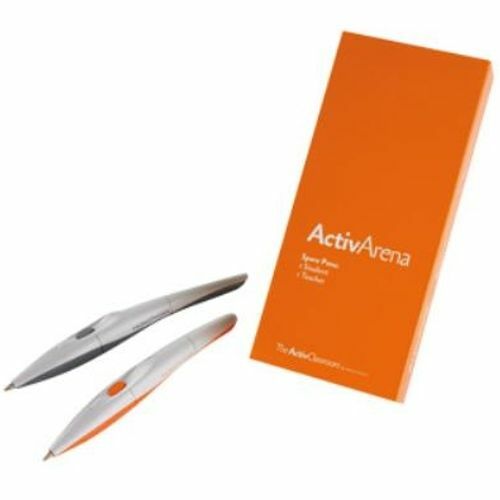 Promerhean ActivArena Spare pen set. In the ActivClassroom, everyone wants to come to the board. With ActivArena, students and teachers can assemble and contribute together. Its two people and two pens toward an endless environment of collaboration. ActivArena turns our ActivBoard into an impromptu gathering point or a tutors corner for one-on-one help sessionsall under the instructors control. Teachers can choose to activate and deactivate the intelligent student pen. The idea revolutionizes interactive whiteboard technology, allowing two students to teach each other or students and teachers to work togetherexponentially enriching the learning experience and enhancing the possibilities of every single lesson.